I was out at Etsy’s offices, aka Etsy Labs, in Brooklyn this morning. I love going there because the company’s offices are also a big workshop, open to anyone at no minimal cost who makes a reservation, where people can work on their arts and crafts. The company is living in the middle of its community. Because Etsy is a community of people who like to make and/or buy handmade goods. 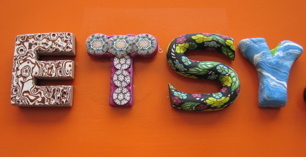 This is a picture of a sign for Etsy’s offices that was made by a group of Etsy sellers called The Polymer Clay Artists Guild. It just arrived one day. And it is really great. I put a few pictures of the sign up on Flickr. Each letter was made by a different Etsy seller. And Etsy Labs is full of stuff like this. If you haven’t been to Etsy, you really need to give them a visit. Here’s how to visit them on the web. And here’s how to visit them in person.